Nearly 40,000 species of spiders inhabit the globe, making their homes on every continent except Antarctica. None of these spiders migrates in the true sense of the word, moving to different regions each year like birds do. However, many spider species do make a once-in-a-lifetime move to a new location, primarily in the late summer and early fall of their birth. All spiders make silk, and their best-known use for it is constructing webs to capture prey. However, young spiders have another use for this silk. Female spiders produce egg sacs with as many as 2,500 eggs inside. After these eggs hatch, the spiderlings have to disperse to avoid competing with one another for prey. They do this by spinning silk to create a balloon- or tentlike sheet that will catch the wind and blow them to new homes. For example, in Chicago a species known more-or-less affectionately as "high-rise flying spiders" take flight each fall after hatching from eggs laid in the crevices of tall buildings. Not all spiders are lucky enough to live in the Windy City. Despite attempts to balloon away, spiders can't float away to a new location if no wind exists to carry them. Dallas residents learned this in September 2013 when the botched take-offs of thousands of spiderlings into calm, clear skies left poles, trees and buildings festooned with silken strands. Many people were unaware of the cause of the sticky clumps and worried some sort of disaster had occurred. The spiders were stranded not far from where they hatched. Tarantulas, the largest of all spiders, live in the United States west of the Mississippi River, from Missouri and Utah south. Every year, males begin a mass migration of sorts in search of mates. Female tarantulas can live more than 30 years, but males seldom live more than 10 years. They spend the first seven or eight years of their lives in their burrows; after their last molt, they get the urge to reproduce. Joined by other males their age, they cross roads and fields together in search of receptive females. After mating, males quickly leave their chosen females, but they don't return to their burrows. They will die soon after. 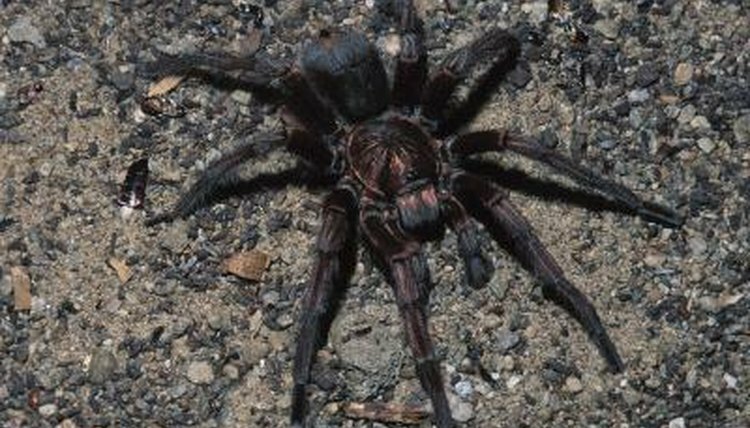 Many people are frightened of spiders, especially tarantulas. Although these large spiders may be stealthy, nocturnal predators, they won't bite people unless cornered and provoked. The bites are comparable to bee stings, and no deaths due to tarantula bite are on record. All spiders are venomous, but only a few species' bites are potentially deadly to human beings. Spiders are beneficial predators who feed on many insects that people consider pests and are essential parts of the ecosystems they inhabit. Texas Parks & Wildlife Magazine: Tarantula!